Demographic trends promise something priceless. By observing the changing structure of a population’s age and income, patient investors who accurately forecast these slow-moving trends can benefit clients over the long term. In the near term, these societal changes can seem a little muddy, and subject to unpredictable influences. Recently, record levels of immigration boosted Germany’s workforce, changing its demographic make-up, while China reversed its one-child policy in a move aimed at confronting problems posed by its ageing society. At a higher level, it can be difficult to determine the best course of action amid those trends, but a deeper investigation into how they affect companies, industries and, eventually, entire economies, is a powerful tool when it comes to making profitable investment decisions. Global demand for protein is rising, driven mainly by health-obsessed millennials and the emerging middle classes in Asia. Growing prosperity in the region means that more Asians are able to afford to consume meat. Demand for pork in China has soared so much that half of the world’s pigs are now reared there. Feeding this ever-increasing livestock population is a challenge, as it takes about three kilograms of feed to produce each kilogram of meat. Soybeans, which are mainly grown in the sunny corn belt of the US and South America, are the main source of animal feed. 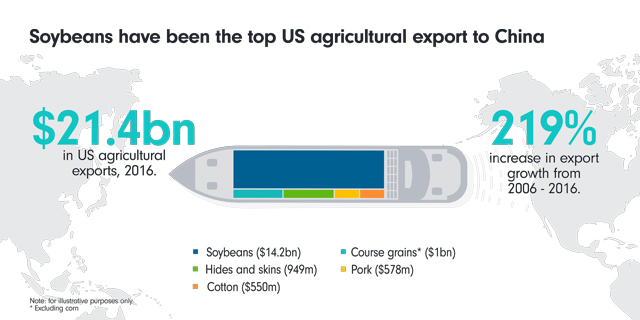 China is the world’s largest consumer of soybeans, and until recently was one of the biggest importers of US soybeans. But the humble soybean has become a casualty of the increasingly bitter trade war between the US and China. Brazil is the world’s biggest soybean shipper and it is set to be the biggest beneficiary of the Chinese tariffs on US soybeans, which have sent prices of US soybeans tumbling. The escalating trade dispute is disrupting the supply chain, giving agricultural trading companies such as Archer Daniels Midland and Bunge a bigger and more complex role. These types of companies could potentially benefit from increased volatility in the market for agricultural goods, boosting their returns after years of global oversupply of food commodities reduced trading opportunities. Chocolate is another commodity enjoying a sweeter outlook, helped by falling cocoa prices and increasing Asian demand. Asia is an underpenetrated market compared with developed countries. 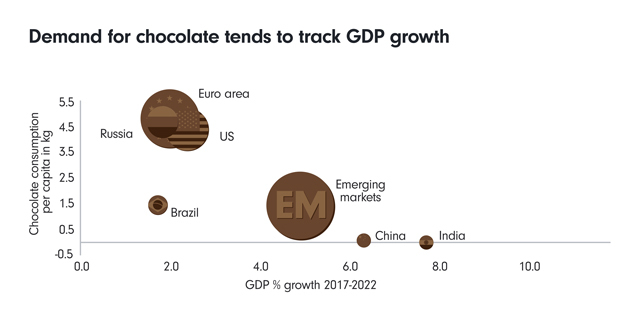 For instance, per capita consumption of chocolate in Switzerland is 8.8 kilograms a year, a lot more than the 100 grams a year consumed by the average person in China or the 200 grams in India. One of the main obstacles to closing this gap is the difficulty in selling luxury chocolate that doesn’t melt in the warmer Asian climates. Many manufacturers are pushing ahead with sales of ‘heat-resistant’ chocolate, which can withstand temperatures of up 38 degrees Celsius, without sacrificing taste. Heat-resistant chocolate is not new - Hershey provided the US army with heat-resistant bars during the Second World War. But with stagnating home markets, manufacturers are now looking to expand to newer economies. Barry Callebaut, Mondelez and Nestle have all developed their own versions of this type of chocolate. Oral care will benefit from the dual demographic trends of growing affluence in developing economies and ageing populations. In some emerging markets, frequency of brushing, and toothpaste use are still low, suggesting ample room for growth. For instance, the American Dental Association recommends 1 milliliter of toothpaste per brush, but the average toothpaste use per day is only 0.64 milliliters China and 0.35 milliliters in India. As countries become wealthier, people can be expected to trade up to more expensive oral goods, such as whitening products. Some 27 per cent or 1.9 billion of the world’s population are children, so the market potential is likely to grow as they reach adulthood and begin to more seriously take care of their teeth. The need for specialised and often more expensive oral care products will also grow as people age. Consumer care company Colgate-Palmolive specialises in oral and personal products. It is active in emerging markets, and will benefit from growing populations and rising incomes in emerging markets such as India and Brazil. Rising incomes in emerging economies are changing eating patterns, as consumers move from healthy, low-calorie diets that are high in grains and vegetables to higher-calorie, Western-style diets that contain more meat, dairy and sugar. These dietary changes, combined with urbanisation, less physically demanding lifestyles and greater use of transport, have led to a surge in ‘western’ conditions such as obesity, which is a major driver of other lifestyle-related illnesses such as cardiovascular diseases and type two diabetes. A drug to combat obesity has so far proved elusive, but an oral obesity pill that will be sent to the US regulator FDA early next year, for a potential launch in the US in 2020, could be the first step in tackling the world’s obesity crisis. The number of people globally with diabetes is projected to rise from 425 million in 2017 to 629 million in 2045. Currently, there are some 187 million diabetes sufferers in India and China, and this number is expected to rise to over 250 million by 2045. 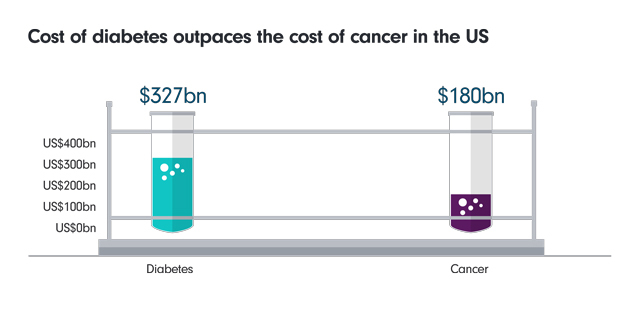 The total cost of diabetes has been estimated at more than $720 billion in 2017 and of this, more than 80 per cent is indirectly related to diabetes - cardiovascular diseases, blindness, renal/dialysis, amputation and general hospitalisation. Technological advances will make diabetes easier to treat. The most exciting of these are the continuous glucose monitoring (CGM) devices, which are currently used by only 3 per cent of type two diabetes sufferers. New devices tend to be smart-phone enabled so that users can monitor their glucose levels unobtrusively through the day, and they also do not require the 5-7 daily finger prick calibrations. These devices could take off in emerging markets such as China and India, which are two of the world’s biggest smartphone markets. Prediabetes, an early sign of the onset of diabetes, affects an estimated 84 million in the US - 90 per cent of whom are unaware they have this. Diabetes, if left unchecked, leads to kidney problems that may require dialysis - a procedure to remove waste products and excess fluid from the blood when the kidneys stop working properly. With renal failure affecting an increasingly younger population, and with extended working lives, dialysis requiring hospital treatment could be disruptive to work and careers. Home dialysis kits offer a safe and sterile option, which could transform the way this condition is treated. The global eyecare market is expected to grow at around 5 per cent annually between 2017 to 2022, with sunglasses growing at 6.5 per cent, eyeglasses at 5.3 per cent, and contact lenses at 4.3 per cent. 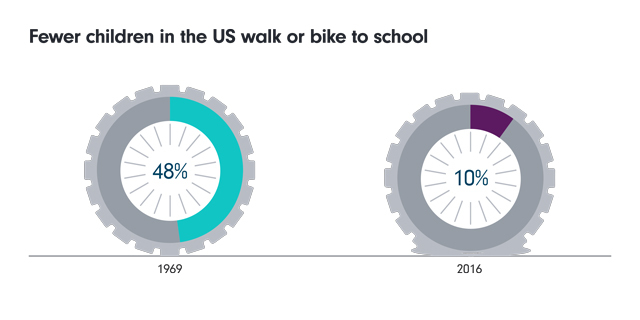 This trend is mostly driven by the growing elderly population, as well as the increasing use of screens and less time spent outdoors. In 2017, around 2.5 billion people lived with uncorrected vision problems. This number is expected to rise to 3.3 billion by 2050. Companies such as GrandVision, which benefit from ageing populations and underpenetrated markets, are also well insulated from online disruption as the physical touchpoint of an eye exam is still essential in most cases. The merger of Essilor and Luxottica is also aimed at benefiting from the strong global growth drivers in the eyecare market. Vision correction could have a huge impact on overall economic activity. A recent study published in the Lancet journal found that productivity among tea-pickers in the Indian state of Assam rose by 21 per cent when half over the age of 40 were given simple reading glasses. 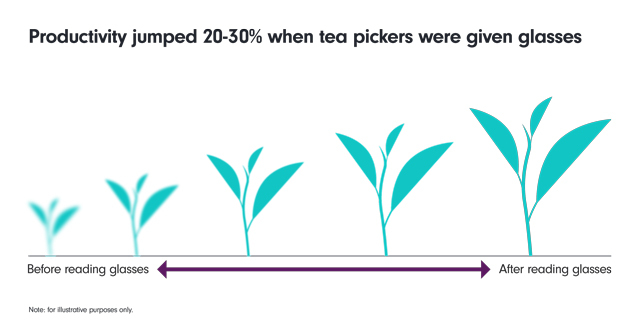 Tea-pickers over the age of 50 recorded even bigger gains, at 31 per cent. Anyone with elderly relatives knows how much time and resources can be spent on arranging their care, or simply worrying about them. Technology allows residents to centrally control their homes’ thermostats, lighting, audio and security systems. As the elderly population grows, these digital technologies are increasingly being used to help seniors remain independent if they prefer to remain in their own homes. Examples of these smart technologies include activity sensor systems that detect abnormalities in seniors’ routines and alerts caregivers if help is needed. 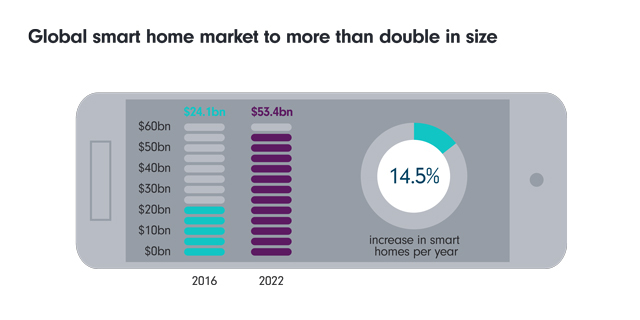 The global smart home market was valued at around $24.1 billion in 2016 and is expected to grow to $53.45 billion by 2022, an increase of over 14.5 per cent each year. A report by the Institution of Mechanical Engineers said the UK’s National Health Service could save billions of pounds each year by installing smart technologies in the homes of older people, allowing them to remain mobile. Ageing populations and longer average lifespans mean more women - and increasingly men - are looking for all the help they can get to maintain their youthful appearances. Greater wealth in emerging economies will mean growing demand for products like skincare, anti-wrinkle creams and hair colouring products, as well as for services such as Botox, plastic surgery and liposuction. This trend overlaps with healthcare, as hospitals cash in on anti-ageing medical tourism and offer wellness retreats at spa-like facilities, often as part of package deals with aesthetic procedures. 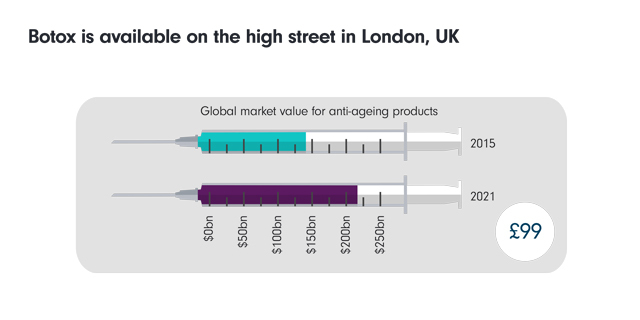 The global market for anti-ageing products was estimated to be worth $140.3 billion in 2015 and is expected to reach $216.52 billion by 2021. The social advancement of women and their higher earning potential is one driver of growth, while another is changing social norms about men’s use of cosmetic products that had been previously regarded as feminine. Growing awareness of such products also means younger consumers are likely to use them preventatively, to extend their youthfulness as long as possible. The old adage that the only certainties in life are death and taxes means that demand for funeral providers is reliably steady. However, the way they market and deliver their services is changing. 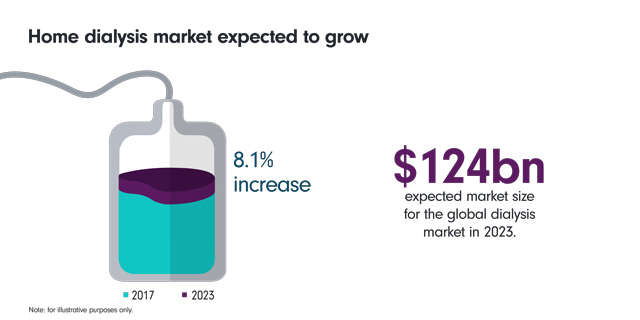 The global death care services market was valued at $98.3 billion in 2017, with Asia Pacific, the largest geographic region, accounting for $36.9 billion or 37.6 per cent of the global market. Rising incomes in emerging markets means more people will be able to afford upscale send-offs for their loved ones. 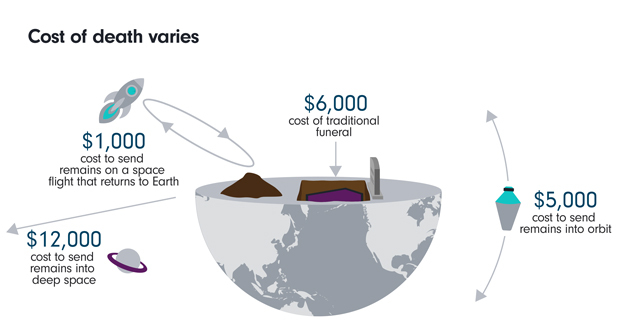 In addition to the traditional burial plots, cremation, urns, headstones and flowers, some funeral packages can include blasting the deceased person’s ‘cremains’ into space. Rising costs mean more consumers are likely to plan ahead, through products such as funeral insurance. Historically, consumers did not turn to the Internet for services such as travel and banking, where online availability is now taken for granted, and such e-commerce growth opportunities can be found in the funeral planning sector as well. The people whose parents are now passing away are among the first generation to book funeral services online, to the benefit of companies such as Japan’s Kamakura Shinsho. Countries such as Japan, which face shrinking labour forces, are already turning to automation to replace human workers, and this trend is expected to continue. Automation is also playing a greater role as emerging countries develop their domestic industries. The industrial robotics market is expected to grow by 175 per cent over the next decade, and a 2017 projection by International Development Corporation predicted that 30 per cent of the world’s biggest manufacturers will have deployed cyber-physical robotic systems, resulting in a 10-20 per cent productivity increase. The next generation of industrial robots, called collaborative robots or ‘co-bots,’ incorporate artificial intelligence and motion sensing ability, with which they can work more safely and efficiently alongside human workers, and require less sophistication to programme. 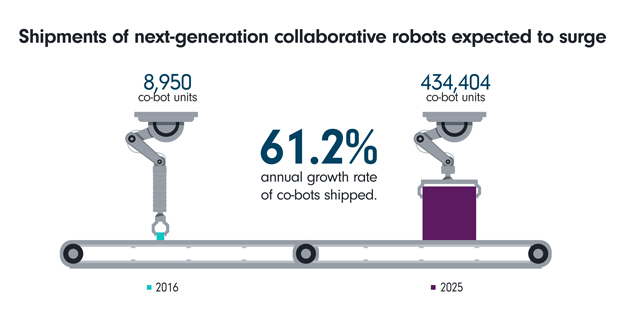 Loup Ventures said in a report last year that it expects total co-bot units shipped to increase to 434,404 by 2025 from 8,950 in 2016, representing a compound annual growth rate of 61.2 per cent. Finding growth areas within automation will mean looking beyond factory assembly lines, and thinking outside the box at consumer trends. For example, as demand for dairy products grows in China and India, the global market for milking machines is expected to rise 11.8 per cent to $2.61 billion by 2025. The world will always be an uncertain place for investors. But some factors, such as the emerging power of consumers in China and India, a growing global middle class and an ageing population, are less uncertain than others. With some close monitoring of these trends, that rare and valuable snapshot of a future world can be put to good use in the financial markets.